Many people hate those who are different. Just look at our world of politics. It is tiresome. From a business perspective, people also hate those who have creative ideas, are willing to challenge the status quo, and who are prepared to act on their big and bold ideas. They will go to extraordinary lengths to try to shut them down. I could swear that I’ve seen an Innovation & Creativity Prevention Department in some of the clients who have booked me over the years! I’ve encountered the people who run them during the Q&A session, or during the pre-event planning and conference calls. They use code words to shield their agenda. “Don’t rock the boat.” “We don’t want to worry people.” “We should be cautious and wary of change.” “There really should be no urgency.” The department has a self-imposed mandate to put up barriers to ideas; to humiliate the creative geniuses who dare to be different; to kill collaborative thinking; to promote inadequate reach as a goal to be achieved. They reward people on conformity rather than excellence. Gosh, they are a tiresome bunch. And their existence is killing you! Famously, I was on a conference call 15 years ago with 2 senior VPs of a global consumer packed goods company. One was aware that the world of consumer influence was changing and twisting – years before social media had an impact. The other was protective of his budget, wary of anyone who might take it away. The planning conference call was ridiculously comical! Today, I can see that the creative soul left the organization, the other is still involved, and the company wallows in a state of aggressive sameness. 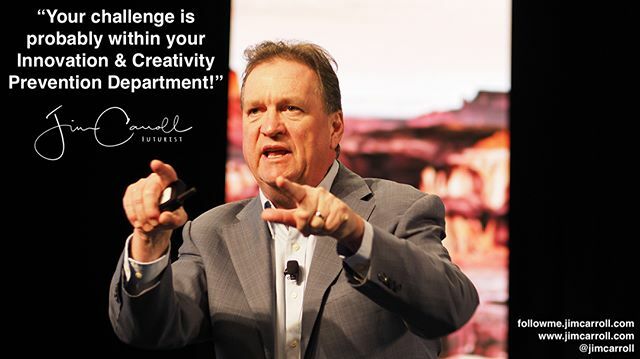 Do this today – go down the hall and find your Innovation & Creativity Prevention Department! Fire them! Give them new jobs! Retrain them! Do something!